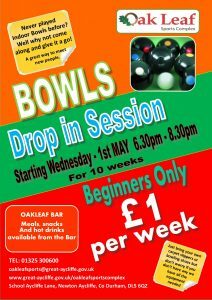 Bowls Drop In Session, never played Indoor Bowls before? Well why not come along and give it a go! Starting Wednesday 1st May 2019, 6.30 pm to 8.30 pm, for 10 weeks. Beginners Only – £1.00 per week. Just bring your own carpet slippers or bowling shoes but don’t worry if you don’t have any we have all the equipment needed.